The vandalism was conducted around dawn this morning and was roundly condemned by Greece’s political parties. There have been two arrests of suspects in a paint-throwing attack at the US Embassy in Athens conducted by the anarchist group Rouvikonas. US Ambassador Geoffrey Pyatt condemned the action of Rouvikonas in a tweet today, in which he offered New Year’s wishes upon his return from a visit to the US. “I do want to condemn this morning’s silly and senseless vandalism at the US Embassy and thank @hellenicpolice for their quick action,” the tweet read. The two people arrested were among ten individuals rounded up by police after the vandalism. 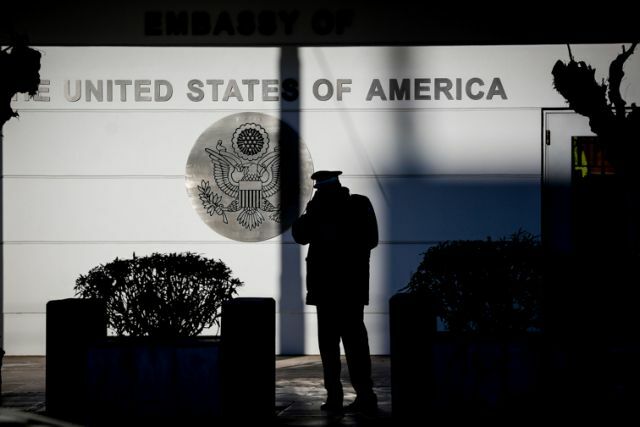 Greek Police said that the two were demonstrably involved in throwing paint at a garage entrance on one side of the Embassy. Once alerted, Greek Police assigned the investigation to State Security, which tracked down the culprits in the area of nearby Mount Lycabettus, through which they attempted to flee the scene. Main opposition New Democracy’s shadow public order minister Maximos Harakopoulos issued a scathing statement in which he linked the government with the actions of Rouvikonas, but also linked the anarchist group with the top gun of the now defunct 17 November terrorist group. 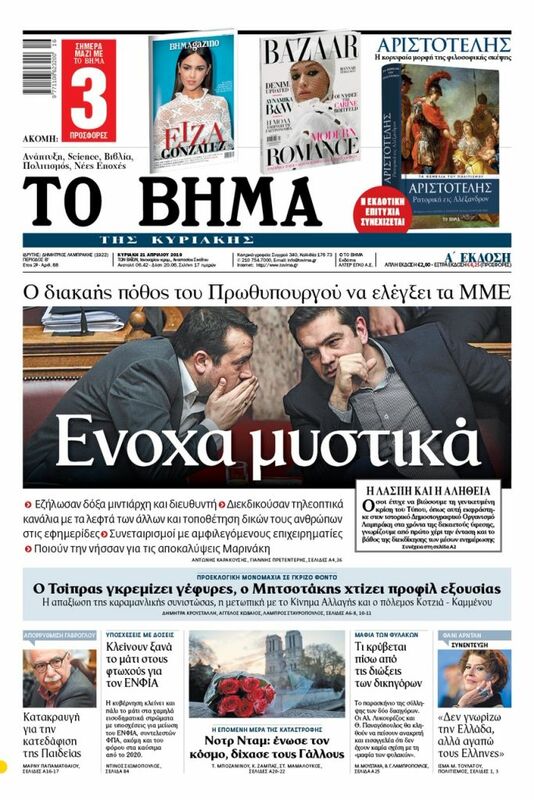 “Even as the ministerial twins [Citizen’s Protection Minister Olga Gerovasilis and Deputy Minister Katerina Papakostas] keep looking for the addresses of the members of Rouvikonas, the beloved “collectivity” of SYRIZA continues to degrade any sense of security. At one of the best-guarded buildings in the capital, ‘the well-known unknown’ [attackers] acted yet again at a foreign diplomatic mission without being impeded by anyone. The image of Greece as a well-ruled and secure state is being harmed internationally,” Harakopoulos stated. On a week-long furlough from serving 11 life sentences [one for each of the victims he murdered], Koufodinas raised a political maelstrom when he took a holiday stroll in central Athens, very near the sites of some of his most notorious hits. “For New Democracy, there is no longer any doubt that this government cannot and does not want to restore citizens’ sense of security and the image of a well-governed state,” the statement concluded. New Democracy MP and former foreign minister Dora Bakoyannis – whose late husband and New Democracy MP Pavlos Bakoyannis was murdered by Koufodinas at his Omirou Street office in central Athens – maintained in a tweet that Koufodinas is functioning as the ideological guide of Rouvikonas. “Koufodinas is walking the streets where he murdered his victims, ‘protected’ by the members of Rouvikonas. Today, when new members of the group operated at the American Embassy, is there anyone who doubts that he is their guide?” wrote Bakoyannis, who is also the sister of New Democracy leader Kyriakos Mitsotakis, who has often accused ruling SYRIZA of tolerating Rouvikonas’ attacks.